Interesting post from Nexenta on recent developments in regards to ZFS, Oracle and NetApp. There is also a podcast which is a Q&A session with Evan Powell, CEO of Nexenta. "Oracle boss Larry Ellison said he'd love to have the 60 per cent of NetApp's business that plugs NetApp boxes into Oracle software, hinting that a NetApp purchase could be on his mind. A combination of Oracle and NetApp would be a truly formidable server/storage play, even if the IBM NetApp reseller deal subsequently collapsed. Will Oracle actually make an approach? Will NetApp respond positively? The key there is whether it truly believes an independent, best-of-breed stance is viable or whether the stack-in-a-box, centralised IT approach is a sustained tank attack that threatens to flatten its business. A future inside Oracle in those circumstances might look a lot better than a slow fade into a Unisys-like state while EMC, buoyed up with VMware and products above raw storage arrays, grows and prospers." Bloomberg also reports on Oracle acquisitions plans. It starts with one 16-core 1.65GHz SPARC T3 processor on the SPARC T3-1 Server . So you get 128 Threads packaged in a 2 rack units chassis. Above this you will find the SPARC T3-2 with two SPARC T3 processors. It gives you 256 threads and 256 GB. You get this amount of power in 3 RU. At the high-end is the T3-4 with four of the SPARC T3 CPU giving you 512 threads, 512 GB of main memory with 8 GB DIMMs and 16 PCI Express Modules. This system is somewhat larger: 5 RU. At last there is a new blade for the Blade 6000 chassis: SPARC T3-1B. As the name suggests it provides 1 SPARC T3 processor, so 128 Threads on one blade. The Register reports on the new systems as well. If you are interested in a brief summary of what T3 is read Joerg post about it here. See the announcement and slides. You can also download ISOs here which are based on snv_147. So it has begun... Is it going to survive in the long term? Joerg reports on Solaris 10 license change. SPARC: Support for ITU Construction Tools on SPARC Platforms - In this release, the itu utility has been modified to support booting a SPARC based system with the install-time updates (ITU) process. You wil find a more in-depth description at docs.sun.com. "NetApp Inc. and Oracle Corp. have agreed to dismiss patent lawsuits against each other, putting to bed a battle that had been ongoing since 2007. The terms of the agreement weren't disclosed, and the companies said they are seeking to have the lawsuits dismissed without prejudice. NetApp President and Chief Executive Tom Georgens said Thursday the companies would continue to collaborate in the future. NetApp, which sells data-storage systems, and Sun Microsystems, which has since been bought by Oracle, began the fight in 2007, with each company alleging the other was infringing some of its patents. Lawsuits were filed on both companies' behalf, with NetApp alleging that Sun's ZFS file-system-management technology infringed a number of its patents. Sun at the time also said NetApp products infringed its patents." See also The Register article. Below is a collection of blog entries on what's going on recently in regards to Open Solaris and Solaris 11. Ben Rockwood - OpenSolaris R.I.P. A rather large and interesting putback for SMF/FMA related technologies went into Open Solaris yesterday. It will be available in build 146. Oracle today announced Dell and HP will certify and resell Oracle Solaris, Oracle Enterprise Linux and Oracle VM on their respective x86 platforms. Customers will have full access to Oracle’s Premier Support for Oracle Solaris, Oracle Enterprise Linux and Oracle VM running on Dell and HP servers. This will enable fast and accurate issue resolution and reduced risk in a company’s operating environment. Customers who subscribe to Oracle Premier Support will benefit from Oracle’s continuing investment in Oracle Solaris, Oracle Enterprise Linux and Oracle VM and the resulting innovation in future updates. Open Solaris 2009.06 + entry level 2U x86 server Sun Fire x4270 + 1U xxxx array. # iostat -xnzCM 1|egrep "device|c$"
Then with a small I/O it can sustain over 400k IOPS - more HBAs should deliver even more performance. It is really amazing how fast technology is progressing. To achieve above numbers 10 years ago it would have cost a small fortune. Brendan Gregg wrote an article in ACM Queue about Visualizing System Latency as heat maps. The article explains really well what latency heat maps are and how to read them. It is also a good read if you want to learn about a rainbow pterodactyl (shown below) flying over an icy lake inside a disk array. It is rather brief but at least it is something. See also a nice commercial below. Last night two new DTrace providers were integrated. They should be available in a build 142 of Open Solaris. also contains probes which fire when a UDP socket is opened/closed. first was described in PSARC/2008/302 DTrace IP Provider." "Oracle announces its new Sun support policy that has the potential to radically change the way in which OEMs offer support and may make third-party maintenance offerings for Sun hardware unprofitable." Recently there has been lots of confusion regarding running Solaris 10 on non-Sun servers. "Certifying Oracle Solaris on ProLiant servers since 1996, HP is expanding its relationship with Oracle to include selling Oracle Solaris 10 Operating System Subscriptions and support from HP Technology Services on certified ProLiant servers. HP will provide the subscriptions and support for the Oracle Solaris 10 Operating System on certified ProLiant servers and Oracle will provide patches and updates directly to HP's customers through Oracle SunSolve. As part of this expanded relationship HP and Oracle will work together to enhance the customer experience for Oracle Solaris on ProLiant servers and HP increase its participation in the OpenSolaris community." And of course you can also run Open Solaris on any x86 hardware, including HP servers, entirely for free if you want. I wonder though if it would make sense for HP to also offer support for Open Solaris - more and more customers are deploying Open Solaris instead of Solaris 10 on their servers and Oracle already offers a support for it on their own servers. what has changed between the snapshots of a dataset. be a later snapshot of the dataset or the current dataset. Please see the case materials of PSARC 2010/080 for the latest design document and read ipadm(1M) man page for more information. This has been integrated into Open Solaris. I didn't know that Windows has a similar technology to ZFS L2ARC which is called ReadyBoost. Nice. I'm building my new home NAS server and I'm currently seriously considering putting OS on an USB pen drive leaving all sata disks for data only. It looks like with modern USB drives OS should actually boot faster than from a sata disks thanks to much better seek times. I'm planning on doing some experiments first. When you create a ZFS volume its write cache is disabled by default meaning that all writes to the volume will be synchronous. Sometimes it might be handy though to be able to enable a write cache for a particular zvol. I wrote a small C program which allows you to check if WC is enabled or not. It also allows you to enable or disable write cache for a specified zvol. Is Dell preventing the use of 3rd-party HDDs now? Thank you very much for your comments and feedback regarding exclusive use of Dell drives. It is common practice in enterprise storage solutions to limit drive support to only those drives which have been qualified by the vendor. 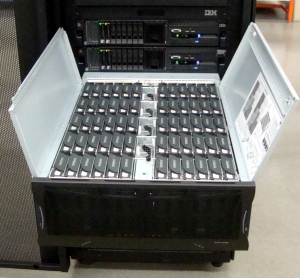 In the case of Dell's PERC RAID controllers, we began informing customers when a non-Dell drive was detected with the introduction of PERC5 RAID controllers in early 2006. With the introduction of the PERC H700/H800 controllers, we began enabling only the use of Dell qualified drives. There are a number of benefits for using Dell qualified drives in particular ensuring a positive experience and protecting our data. While SAS and SATA are industry standards there are differences which occur in implementation. An analogy is that English is spoken in the UK, US and Australia. While the language is generally the same, there are subtle differences in word usage which can lead to confusion. This exists in storage subsystems as well. As these subsystems become more capable, faster and more complex, these differences in implementation can have greater impact. Benefits of Dell's Hard Disk and SSD drives are outlined in a white paper on Dell's web site at http://www.dell.com/downloads/global/products/pvaul/en/dell-hard-drives-pov.pdf"
I understand they won't support 3rd party disk drives but blocking a server (a RAID card) from using such disks is something new - an interesting comment here. From my own experience their sales people are very aggressive with an attitude of sale first and let someone else worry later. While I always take any vendor claims with a grain of salt I learnt to double or even triple check any IBM's claims. Now lets wait for some benchmarks. I only wish Solaris was running on them as well as right now you need to go the legacy AIX route or not so mature Linux route - not an ideal choice. Reading the registration keys failed on quorum device /dev/did/rdsk/d7s2 with error 22. The d7 quorum device was marked as being offline and we could not bring it online again. There isn't much in documentation about the above message except that it is probably a firmware problem on a disk array and we should contact a vendor. But lets investigate first what is really going on. By looking at the source code I found that the above message is printed from within quorum_device_generic_impl::quorum_read_keys() and it will only happen if quorum_pgre_key_read() returns with return code 22 (actually any other than 0 or EACCESS but from the syslog message we already suspect that the return code is 22). The quorum_pgre_key_read() calls quorum_scsi_sector_read() and passes its return code as its own. The quorum_scsi_sector_read() will return with an error only if quorum_ioctl_with_retries() returns with an error or if there is a checksum mismatch. 452   CMM_TRACE(("quorum_scsi_sector_read: ioctl USCSICMD "
459  // Calculate and compare the checksum if check_data is true. 460  // Also, validate the pgres_id string at the beg of the sector. 465   // Compare the checksum. 474   // Validate the PGRE string at the beg of the sector. 475   // It should contain PGRE_ID_LEAD_STRING[1|2]. 481    CMM_TRACE(("quorum_scsi_sector_read: pgre id "
21  -> __1cNdbg_print_bufIdbprintf6MpcE_v_   6309628794339298 quorum_scsi_sector_read: checksum mismatch. So now I knew exactly what part of the code is casing the quorum device to be marked offline. The issue might have been caused by many things like: a bug in a disk array firmware, a problem on an SAN, a bug in a HBA's firmware, a bug in a qlc driver or a bug in SC software, or... However because the issue suggests a data corruption and we are loading the cluster with a copy of a database we might have a bigger issue that just an offline quorum device. The configuration is a such that we are using ZFS to mirror between two disks arrays. We have been restoring a couple of TBs of data into and we haven't read almost anything back. Thankfully it is ZFS so we might force a re-check off all data in the pool and I did. ZFS found 14 corrupted blocks and even identified which file is affected. The interesting thing here is that for all blocks both copies on both sides of the mirror were affected. This almost eliminates a possibility of a firmware problem on disk arrays and suggest that the issue was caused by something misbehaving on the host itself. There is still a possibility of an issue on SAN as well. It is very unlikely to be a bug in ZFS as the corruption affected reservation keys as well which has basically nothing to do with ZFS at all. Then we are still writing more and more data into the pool and I'm repeating scrubs and I'm not getting any new corrupted blocks nor quorum is misbehaving (I fixed it by temporarily adding another one, removing the original and re-adding it again while removing the temporary one). While I still have to find what caused the data corruption the most important thing here is ZFS. Just think about it - what would happen if we were running on any other file system like: UFS, VxFS, ext3, ext4, JFS, XFS, ... Well, almost anything could have happened with them like some data of could be corrupted, some files lost, system could crash, fsck could be forced to run for many hours and still not being able to fix the filesystem and it definitely wouldn't be able to detect any data corruption withing files or everything would be running fine for days, months and then suddenly the system would panic, etc. when application would try to access the corrupted blocks for the first time. Thanks to ZFS what have actually happened? All corrupted blocks were identified, unfortunately both mirrored copies were affected so ZFS can't fix them but it did identified a single file which was affected by all these blocks. We can just remove the file which is only 2GB and restore it again. And all of these while the system was running and we haven't even stopped the restore or didn't have to start from the beginning. Most importantly there is no uncertainty about the state of the filesystem or data within it. "The European Commission has approved under the EU Merger Regulation the proposed acquisition of US hardware and software vendor Sun Microsystems Inc. by Oracle Corporation, a US enterprise software company. After an in-depth examination, launched in September 2009 (see IP/09/1271 ), the Commission concluded that the transaction would not significantly impede effective competition in the European Economic Area (EEA) or any substantial part of it." I need to observe MySQL load from time to time and DTrace is one of the tools to use. Usually I'm using one-liners or I come up with a short script. This time I thought it would be nice to write a script so other people like DBAs could use without having to understand how it actually works. The script prints basic statistics for each client connecting to a database. It gives a nice overview for all clients using a database. The NCQRS column represents the number of queries which were not served from the MySQL Query Cache while QRS represents all queries issued to MySQL (cached, non-cached or even non-valid queries). If values of VTIME are very close to values of TIME it means that queries are mostly CPU bound. On the other hand the bigger the difference between them the more time is spent on I/O. Another interesting thing to watch is how evenly load is coming from different clients especially in environments where clients are identical www servers behind load balancer and should be generating about the same traffic to a database. All values are measured since the script was started. There might be some discrepancies with totals in the summary line - this is due to rounding errors. The script should work for MySQL versions 5.0.x, 5.1.x and perhaps for other versions as well. The script doesn't take into account connections made over a socket file - only tcp/ip connections. VTIME      total CPU time in seconds for all queries\n"
When doing MySQL performance tuning on a live server it is often hard to tell what impact there will be on all queries as sometimes by increasing one of the MySQL caches you can make some queries to execute faster but others might get actually slower. However, depending on your environment, it might not necessarily be a bad thing. For example in web serving if most queries would execute within 0.1s but some odd queries need 5s to complete it is generally very bad as user would need to wait at least 5s to get a web page. Now if by some tuning you manage to get these long queries down to below 1s with the cost of getting some sub 0.1s queries taking more time but still less than 1s it would generally be a very good thing to do. Of course in other environments the time requirements might be different but the principle is the same. Now it is actually very easy to get such a distribution of number of queries being executed by a given MySQL instance within a given time slot if you use DTrace. That is much better. It is of course very easy to change the resolution of the histogram - but I will leave it for you. The script doesn't distinguish between cached and non-cached queries, it doesn't detect bad (wrong syntax) queries either - however it is relatively easy to extend it to do so (maybe another blog entry one day). It should work fine with all MySQL versions 5.0.x and 5.1.x, possibly with other versions as well. Yesterday I was looking at some performance issues with a mysql database. The database is version 5.1.x so no built-in DTrace SDT probes but still much can be done even without them. What I quickly noticed is that mysql was issuing several hundred thousands syscalls per second and most of them were pread()s and read()s. The databases are using MyISAM engine so mysql does not have a data buffer cache and leaves all the caching to a filesystem. I was interested in how many reads were performed per given query so I wrote a small dtrace script. The script takes as arguments a time after which it will exit and a threshold which represents minimum number of [p]read()s per query to query be printed. So now each query is issuing 5 orders of magnitude less reads()! Granted, all these reads were satisfied from ZFS ARC cache but still it saves hundreds of thousands unnecessary context switches and memory copying s making the queries *much* more quicker to execute and saving valuable CPU cycles. The real issue I was working on was a little bit more complicated but you get the idea. The point I'm trying to make here is that although MySQL lacks good tools to analyze its workload you have a very powerful tool called dtrace which allows you to relatively quickly identify what queries are causing an issue and why. And all of that on a running live service without having to reconfigure or restart mysql. I know there is the MySQL Query Analyzer (or whatever it is called) but it requires a mysql proxy to be deployed... In this case it was much quicker and easier to use dtrace. Below you find the script. Please notice that I had hard-coded the PID of the database and the script could be clean up, etc. - it is the working copy I used. The script can be easily modified to provide lots of additional useful information or it can be limited to only a specific myisam file, etc. cannot be imported on the same host as the original. imported on any machine that supports that pool's version. The new feature should be available in build 131.